William Hill is America's largest sports book operator, with 80 years of experience, taking over 1 million bets a day. 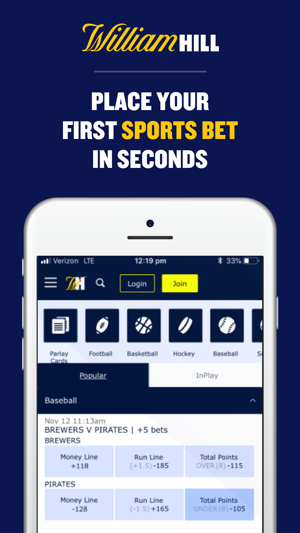 Our award-winning app allows you to instantly place bets in the palm of your hand. · Wager on your favorite games including football, baseball, basketball, hockey, soccer and more! · Featuring live InPlay wagering during the game. Place your InPlay bet during the game and watch live odds adjust as the game is played! We’ve made a few subtle changes to improve your experience. Thanks for betting with William Hill. If I could give this app zero stars, even that is too high. I’ve had this for a few months, and every time it’s crunch time on a football Sunday, you can almost never sign in. I guess the app can’t handle the heavy traffic. Whatever the reason, it’s a disgrace. This past weekend was the last straw. The app was down Saturday late afternoon and I missed the 4:30 NFL game, and then come Sunday, the app was down ALL DAY. it didn’t come back till some time before the night game. Then you go to Monmouth Park, and they can’t even give you your money to bet with cause the ‘app is down.’ I’ve never been associated with such a Mickey Mouse operation such as this, and I’ve been dealing with sports books for 30 years. You call the customer service agents to complain and find out when the app is gonna be back up, and all they say is ‘they didn’t tell us how long.’ Well one thing I can guarantee is that’s the last time I get shut out by William Hill. And what a shame being that It finally became legal in Jersey. Bye bye William. Not nice knowing ya. 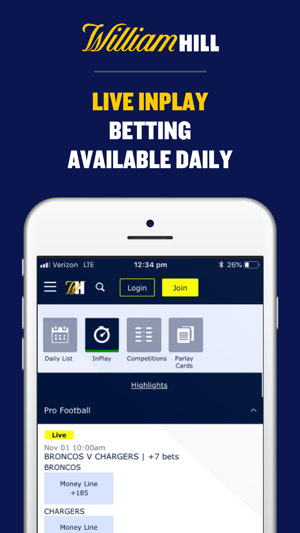 DO NOT USE THIS APP UNLESS YOU ENJOY CONSTANT CRASHES AND HAVING BETS GETTING CANCELED. TERRIBLE CUSTOME SERVICE THAT NEVER ACCOMMODATES YOU FOR THEIR ERRORS. Today I bet a first half under on a basketball game that won. I log back on to see the bet never registered. Then I go to place a bet for an nfl playoff game and the whole app is frozen. I call customer service to ask if they can at least trace the bet I placed earlier and they said it's lost money, there's nothing they can do. So now I'm short money I should've won and cant bet at all. Oh by the way this is 5th time this has happened in the last several months, and it's always right before major games like nfl Sunday or college playoffs. For the amount of money this sportsbook makes its absolutely disgraceful how crappy their app is and how it always freezes and crashes. I will be looking to switch and I want to make it clear to everyone. William Hill is a good sports book. This APP, however, is TERRIBLE. Okay folks, let’s call it what it is. 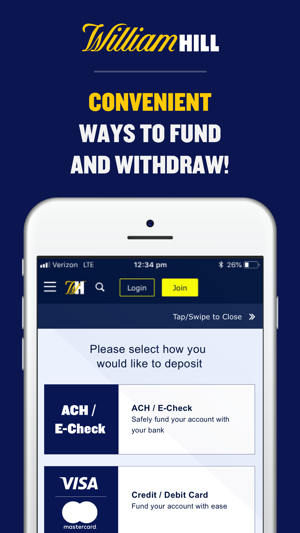 This app is just poorly designed, full of bugs, and overall is a disgrace to the William Hill brand. 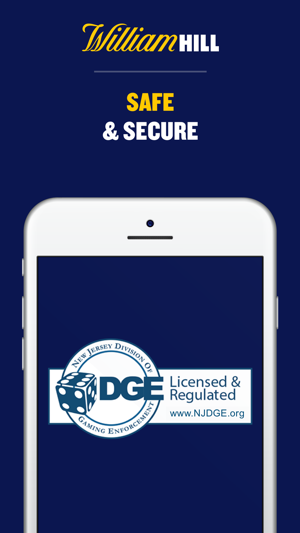 Do the folks over at William Hill or these sorry developers even use their own app? If so, how do you not immediately get concerned? For the amateurs who wrote this app, here’s a message: You start with THE CUSTOMER EXPERIENCE and work backwards, not the other way around. Please take a second to actually use your app and realize how terrible it is. The competition for the sports betting market is fierce. If this company wants to stand a chance, FIX YOUR APP and improve your customer experience. This is basic business 101. Sad, some schmuck from New Jersey has to educate you guys on this. Again, FIX YOUR APP. © 2018 Computerized Bookmaking Systems, Inc.